Does the weather affect carpet cleaning? 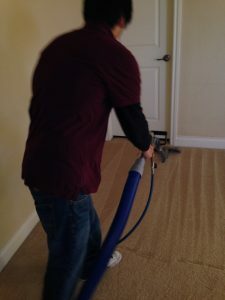 Many people wonder if they should get their carpets cleaned while it’s cold or raining. Customers are constantly calling in rescheduling appointments due to the weather; however, it is not always necessary to do so. Beyer Carpet Cleaning works if it’s raining, sunny, cold, or hot outside. Their technicians are ready for any kind of weather from dressing properly for the day to ensuring the equipment is safe from the elements of the mother nature so you only receive the best carpet cleaning. Beyer Carpet Cleaning is able to work no matter what the conditions are weather wise because they have a process in order to ensure your carpets are truly cleaned. Regardless of what kind of weather Beyer’s technicians work starting with the furthest room in your home. Once they have completed the furthest rooms they work their way towards the front of the home. This way if it is raining and any mud or grass were to have been tracked in by the technician or the hoses everything will be cleaned up by the time the tech is done. Working backwards doesn’t only ensure that the tech is able to clean any mess he may have caused but it also ensures that you and your family will not get the main rooms of the home dirty as well. 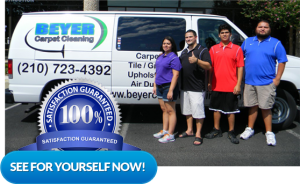 Their carpet cleaning process is one Beyer Carpet Cleaning takes seriously. They do not want unhappy customers. This same process is applied when it comes to tile and grout cleaning. If you are only having one section of your home cleaned, like just one room or sofa, and a Beyer tech were to track something in they will clean it at no extra charge. Beyer Carpet Cleaning believes in being fair and offering great customer service. So no matter the weather Beyer Carpet Cleaning is ready to clean your carpet today. Give them a call at (210)723-4392 or visit https://www.beyercarpetcleaning.com for a free estimate.